Retirement planning is a challenging task. Especially in country like India where social security is almost found missing, retirement planning is an essential today. What makes retirement planning cumbersome is identifying the right corpus required for retirement. The challenge comes from the fact that it is not easy to predict inflation and hence it is very difficult to calculate inflation adjusted retirement corpus. Every now and then emerging new requirement of individuals makes this job even more difficult. Even if you identify retirement corpus, it is very difficult to identify the right asset class where investments need to be done in order to achieve the goal. So the most important challenge is how can an investor identify the right asset class for creation of a strong retirement corpus? There is no denying the fact that equity is a must for creation of retirement corpus in which investment can be either made directly or through mutual funds. Selecting right stocks for retirement planning is very important. L&T: L&T is my first recommendation stock for retirement. L&T is well diversified company doing business almost in every sector. This stock has performed very well in past one decade. Growth story of stock is visible to everyone; stock was trading at Rs. 50 in 2002 while today it is trading with price 30 times above. Stock is expected to deliver even better performance in future. ITC : Though the business carried out by ITC is not very ethical ,as far as value addition for shareholders is concerned, the stock has performed very well during last fifteen years and has got attractive prospect for future business growth. ITC has delivered 25.7% growth in shareholders return over a period of 16 years from 1996-2012 which is too good to be part of any investment decision. Whether past performance can be continued in future is always debatable, but the fact remains that considering the increasing diversification of products and a vibrant management, this growth potential can be continued in future as well. ITC is anyways the most defensive bet for the market as a whole. State Bank of India: This stock has not performed well during last few years due to NPA related issues. But the stock holds a great future. There is no match for SBI in terms of branch reach, customer base and product profile. The bank is bound to grow. In Jan,2001 the stock commanded a price of Rs. 182 which has gone up around 14 times now. This price does not consider other form of returns such as dividend and other corporate action that the company has announced from time to time. The most important fact to consider while investing in SBI as a stock is that financial sector is bound to see a robust growth in the years to come. As the income level of people increases, reach of banks in terms of deposits and lending products is bound to grow. SBI is going to be a major beneficiary of this. SBI carries the prospect of long term value creation for investors and hence should be part of retirement portfolio. CRISIL: CRISIL story is linked to India growth story. Credit rating in India has grown with the liberalization. CRISIL has a credit rating institution has shown tremendous growth over a period of time. The income from business has been growing consistently and so has been the cash operating profit of the business. If India growth story has to continue, credit rating institution like CRISIL has an important role to play. As more and more businesses get established in the country and as more and more financial instruments are issues, CRISIL will continue to show good growth. As an investor, one can believe in a stock like CRISIL for long term consistent return. Dr Reddys : Pharma has been one sector where India has done extremely well. There are many potential contender in this space which classify as a stock that can feature as a part of retirement planning stocks. Dr. Reddy is one stock . It has shown consistently good performance in terms of revenue, EBITDA and ROCE. Also considering the fact that India is likely to be global hub for pharma, Dr. Reddy is a safe bet for long term investment. HDFC: HDFC as a stock has been all seasons stock in India. It’s performance over a period of time has shown that it is almost insulated from the crisis that real estate industry in India has faced. The growth of the company has been good and the return to the shareholders has been extremely attractive. In a country of more than 125 crore population and ever rising housing need, there cannot be a better bet than HDFC for long term investment. Infosys: Infosys known as best stock pick in IT sector. This stock has given magnificent return in past. In 2002 stock was trading at Rs. 500 today stock price has grown by 5 times. In between bonus is given two times. Investor who has made investment in this stock via IPO has became carorepati. With growing demand in IT sector we expect this stock continue to perform. I recommend this stock to keep in your portfolio for retirement. There is a comprehensive list of stocks that can feature as a part of stocks that can be used for retirement planning. There are many upcoming companies which may probably give better returns than these stocks. But what has been the most important factor in selection of these stocks is the fact whether the stocks will continue to perform consistently over a long period of time. After all, retirement planning is a long term planning. In case of retirement planning, it is always better to go with known stocks rather than venturing into unknown entities. Do share this with your friends looking for happy retirement! 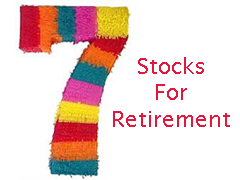 7 stocks for retirement planning is a good article with good stock recommendationa. thanks for posting this article. My view is that one stock which should be there in this seven stock is HDFC bank.If you see its result it has done exceptionally well quarter over qarter for almost 52 quarters. With strong brand and excellent management it should be one of the top performing stock over a long term. Thank you for compliments. I am quite positive about performance of these stocks in future. I will surely try to work out on your suggestion of identifying multibagger small cap stocks for retirement. This article “7 stocks for retirement” is fantastic. Hope these seven stocks will yield the same returns in the future too. As you mentioned, L&T was Rs.50 in 2002 and now it is trading 30 times more to its value, is it better to identify similar small firms now which will yield similar returns like L&T. I know it’s difficult task to identify such multibagern in current sinerio but if we identify such 7 small cap stocks for retirement, then if any one stocks clicks like L&T then one should have a better retirement life. I always reay all your articles and unknowling you are helping many flocks like me.